My friend Nortehanon and I live very far apart. She lives in the Philippines while I call Virginia home. We both come from big families, love children’s book and all things simple. My favorite part of our friendship is how she teaches me her kind and gentle ways of loving her home and people. It all started when she wrote me last year to tell me about a project she was working on called Pens of Hope. 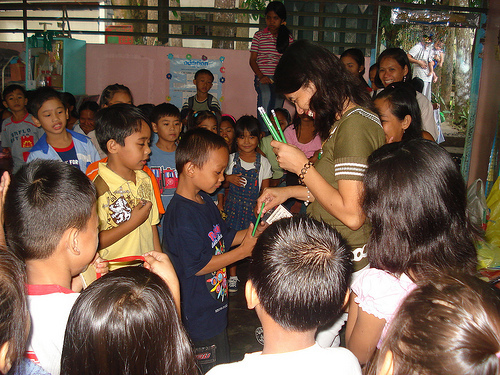 Nortehanon (which is really what you call someone from the province of Northern Samar) gathered pens to take back to the kids of her town who really needed a very simple thing like pens for school. Isn’t that great? Pens! These are special pens, they are pens of hope. I can only imagine what goodness can from writing, drawing, creating and learning, can you? It is such a lovely and simple idea, with so much hope wrapped up in it. I can’t tell you how excited I am about it. I am mostly excited about Nortehanon and our shared love of kindness work, so much so, that I’m dreaming one day I can go meet her in Northern Samar, in her hometown and pass out hope with her while I gather my own from new friends…until then I’m inviting you to join us in a Nortehanon and KindnessGirl Challenge. Do you think we can collect 5,000 pens and pencils by Mother’s Day (Sunday, May 10th)? I think we can do it! You can find all the info here and see pics from the last project here. Nortehanon needs pencils this go around, so gather your kids, your grandmother, your dog and head out to buy pencils (the pretty glitter kind or regular old standard #2, colored too). This is a great opportunity for a neighborhood project, a recipient for lemonade stand profits, or other clever ideas your kids can come up with to gather funds to purchase the pencils. It’s perfect for students of all ages, for artists, for lovers of travel, for kindness workers, anyone who feels the call of friendship. In every donation, please write a short note or send a picture, introduce yourself…make a friend! or if you are in Richmond, you can write me at patience@kindnessgirl.com and I’ll give you an address of where to send them so we can send a big shipment together to Pens of Hope. I’m headed out to get a post office box today, it’s so thrilling! If you would like to spread the word, you can grab a badge here. Look for more info soon…and start collecting pencils and a little hope for all of us!!!!! Oh, that is so cool! I will make a little note to myself to find some special pens to send to these special kids! I already added the gadget on my blog and I’m all for it. pencils this time but let’s send both kinds (regular and color) Chris! Thanks for asking…. I can not believe I found this post tonight!!! I was just telling my daughter we need to find some wway to get these pencils to kids who need them!! We have boxes of pencils and would love love to send them to your friend!! I can’t find the words to tell you how much I appreciate everything that you are doing for Pens of Hope, P.
And to everyone, thank you for your support. You’ll be making many kids here smile and experience how it feels to go to school without worrying about not having a pencil to use. Patience, This is so awesome. I’m spreading the word on my blog and trying to get J’s Girl Scouts and MM Compass club in on it too. Love this and I’m sharing it with my friends! Will be sending some pencils soon!